All I want to do make the existing SW templates active in Windchill, so when I start a new part from workgroup manager it opens new parts in SW correctly. Reading all the guides like Workgroup Manager for SolidWorks® Installation and Configuration Guide, which refers to the workgroup Help files I am getting nowhere in finding a simple answer. All is based on Creo. Manuals refer to manuals, PTC e-support is even worse, all looks like it is written for lawyers with references and over-complex screens, but no solutions. Suggestion for improvement: When PTC supplies Windchill to SolidWorks customers, Windchill - SolidWorks should contain a help file document based on SW, not one that explain all about Creo with occasional notes about AutoCad or Solidworks. I need a simple step-by-step instruction of how setup Windchill using my existing part PRTDOT, assembly ASMDOT and drawing DWGDOT templates. 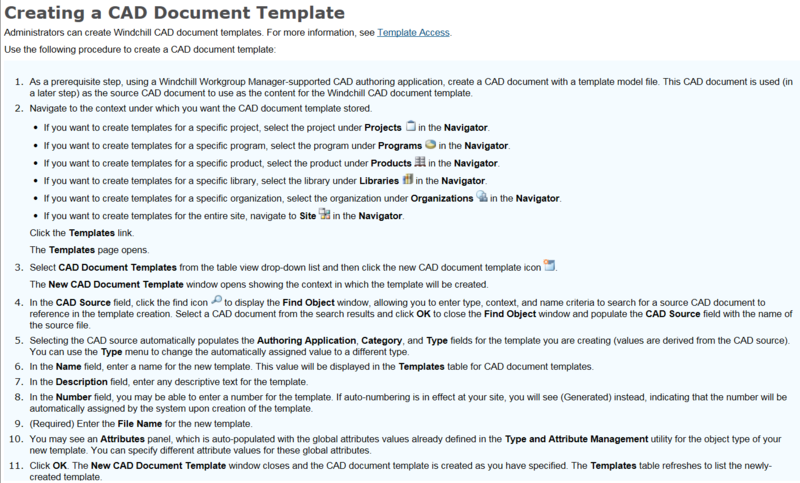 In Windchill Workgroup Manager Help Center (Windchill Workgroup Manager>Help>Help Center), if you search for "Creating a CAD Document Template", you will find below content. I agree that, it is a generic documentation, but it can be used for the template file formats that you would need to create in Windchill. Please let me know, if you require further clarification. Pasting content below for ready reference. 1. Register the required server and workspace in WWGM. 3. Save the opened template to the workspace by clicking ‘Save to Workspace’. 4. Open the WWGM, Select the template & Perform Check-In. 5. Repeat the above steps for the remaining templates that you want to import into Windchill. 6. To verify the added templates, log on to Windchill, navigate to the location where the templates were Checked In. Hope it helps you resolving your issue. Just wondering, can this process be used without an auto-numbering scheme. We are not using the Auto-Numbering methods in Windchill. Yes, this process be used without an auto-numbering scheme.